FLIR introduces their newest addition to their line of thermal imagers. The FLIR C3 is a pocket-sized, full-featured thermal camera which allows for fast and precise thermal inspections. The C3 is next in line after the C2 which has the same features but with the addition of Wi-Fi capability allowing for much easier sharing of images and reports. The C3 model is ideal for assisting building inspectors in looking for problems of moisture intrusions, water damages, electrical faults, HVAC, and facilities’ maintenance because of its many features and very small size. One of the biggest advantages of the FLIR C3 is that it is not a full-size thermal imaging camera and will fit into almost any pocket making it very easy to carry with you from inspection to inspection. The C3 is more efficient and convenient for professionals. It hosts all the special functions you would need to utilize while out in the field. This includes picture-in-picture, MSX image detailing, Wi-Fi connectivity, multiple measurement modes, and high resolution. The FLIR C3 allows users to take it with them around the plant with no hassle. It is small and ultralight such that you don’t need a bag or carrying case when taking it on the go. Its slim size allows it to easily fit into almost any pocket. The FLIR C3 thermal camera stores images with up to 4800 pixels. The high-performance uncooled microbolometer comes with a large 320x240 detector. This allows you to capture images from as far as 60ft from the target without losing any measurement accuracy. The full radiometric capability allows capturing of thermal images from 14 to 302 0F (-10 to 150 0C). As for individual measurements, you’ll be able to analyze data using FLIR tools available in the camera for PC and Mac. The FLIR tools app gives access to thermal and visual images, interpreting of data, and changing color palettes; enabling you to easily create a custom and professional report. All thermal images are stored in JPEG format making it easy when transferring to any reporting software or another computer. This thermal camera comes with the unique MSX image enhancement that adds critical details from the built-in visible light camera to the infrared image in real time. FLIR developed the system by combining photography with thermal imaging so whether you are streaming the image via USB/WiFi or viewing it directly on an LCD screen, you’ll get a much more detailed image. It includes details of the structure like dates, letters, numbers, and labels. It helps in identifying the exact location of a heat problem. It dramatically improves the usability of this camera as there’s no need of having a separate digital camera. You can detect, and make conclusions about anomalies as soon as you find them. Basic temperature measurements are taken on the center spot meter/crosshair. Professionals will appreciate that you don’t have to be too close to capture the required measurements. Close range measurements can also be taken with the fixed 41-degree lens. It provides a full viewing area which comes in handy when taking images in small spaces. Additionally, the C3 has area box measurement which detects the hottest and coldest spot automatically in the scene you’ll be viewing. The C3 also allows for the making of adjustments that account for object emissivity. 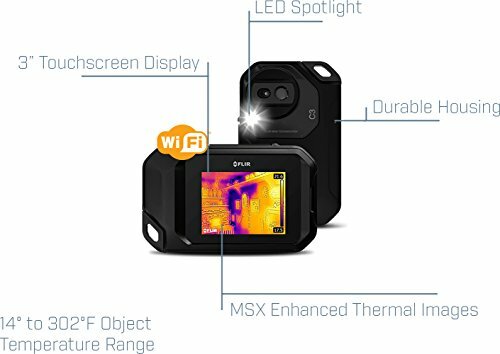 One of the obvious features that stands out in the FLIR C3 (unlike the Flir C2 that does not include WIFI) thermal imager is its wireless capability. 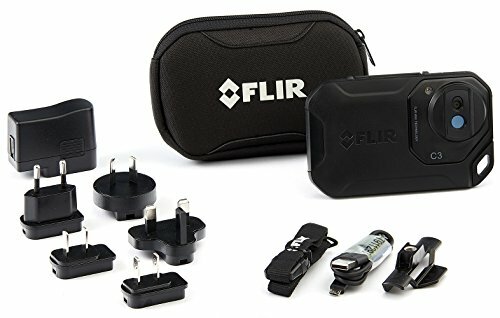 It connects wirelessly to smartphones and tablets which use the free FLIR Tools Mobile App. Wireless connectivity is possible directly via ad-hoc connection (peer-to-peer) or over a network. The mobile app can capture images directly to the camera, download images, or mirror the thermal camera screen. Mirrored images can be shared with others in real time. It is a useful feature when conducting inspections where you may need to share the information with the homeowner or another professional. This makes repair confirmation simple, especially for on-the-fence customers. The 3-inch capacitive touchscreen provides image inspecting and user-friendly operation of the device. It has a generous 45-degree field of view which offers frames in more of the scene just the way seasoned pros like it. Auto-rotation is also possible, and useful for simpler viewing. The screen includes a number of color palette options like iron, gray, rainbow, and rainbow HC. The touchscreen displays visible images, MSX, thermal pictures, picture-in-picture, and it is useful when you need to view the gallery of previously stored images. Picture-in-picture mode allows the display of thermal images on top of normal digital images using a thermal box. It makes sure that you can inspect thermal data while clearly seeing the surrounding environment. The FLIR C3 uses only two buttons; the image capture button and the power button. The image capture button is quite large such that pressing anywhere on it will take the picture. The C3 offers one-hand usage since the device is slim and fits comfortably in your hand. The FLIR C3 operates using a USB rechargeable Lithium-Ion battery located at the back of the device. You’ll get two hours of continuous use time, and over 24 hours in the standby mode. The battery takes around 1½ hours to recharge via the FLIR included power supply. The built-in flashlight can be of use in dark spaces. It offers extra illumination, especially for building applications. It helps to light up an object without adding shadows which could change the quality and details of the images you capture. It helps to control the angle of light so that you can promptly detect problems in a facility. You will notice that although the C3 is small, it is extremely rugged. It is built to sustain falls up to 6ft; perfect for construction sites or other hazardous areas. It has a rubber exterior that offers simple handling while housing the internal components. Falls, bumps, and scrapes are all accounted for in the design showing FLIR knew what work environment the C3 needed to be able to function in. The FLIR C3 thermal camera is an exciting camera for everyday professional use. It has an aesthetically appealing exterior, following the design of a smartphone. It is highly functional owing to the high-resolution thermal detector, MSX imaging, and Wi-Fi connectivity. The device provides professionals in the building and construction industry incredible image detail when performing electrical and HVAC inspections. It is an excellent replacement for IR thermometers especially because of the entry-level price point. The FLIR C3 can also be good for homeowners looking to purchase a small thermal imaging camera for inspections around the house.